RV shows often have the best prices people can find on RVs. The problem is, once the shows are over for the year, those low event prices can be hard to find. Unless you’re ready to buy and have already done research online, the high-pressure environment of an RV show can make you feel rushed to get a good deal. With over 1,600 RVs to choose from, you’re bound to find the right vehicle to suit your needs. They have a diverse selection and options for all budgets—from $19,999 motorhomes to luxurious coaches worth over $2 million and every price in-between. Some close-out deals take up to 40% off, and they always offer a 25% discount on new motorhomes. This year, they already gave us a sneak peek inside the new 2018 Forest River FR3 32DS (pictured above), 2019 Entegra Coach Odyssey 25R, and 2019 Cruiser RV Radiance Ultra Lite 25RB. 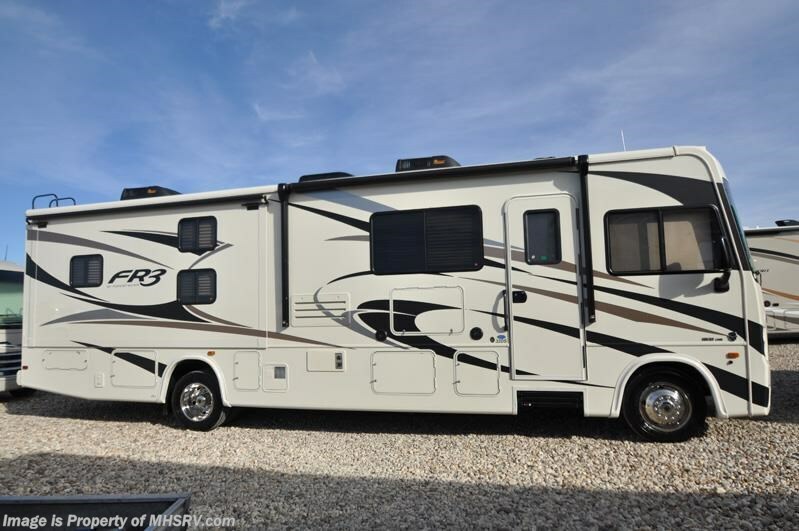 If you prefer used RVs, they also have several pre-owned motorhomes to choose from including Winnebagos, Jaycos, and Itascas. With the same show prices online, they keep the buying experience pressure-free and make the RV show accessible to anyone in the world. You can take extra time researching each model you’re interested in before spending money on a new rig. If you’re not in the Dallas-Fort Worth area, Motor Home Specialist also provides a free shuttle service from the airport when you fly in to pick up your vehicle. Admission is free, parking is free, and they provide overnight RV parking at no cost. Not only that, stop by any afternoon from 11am-2pm to browse their RVs and they’ll serve you a free lunch at the on-site cafe. They also have golf carts available to drive across their 200-acre grounds to see everything from the Class As to the toy haulers and fifth wheels. Through April 21st they’ll be wrapping up their final week with on-site demonstrations from industry experts, but the show prices will remain all year on their website at MHSRV.com and TheWorldsRVShow.com. You can also see more demonstration videos on their Facebook page and Youtube channel.